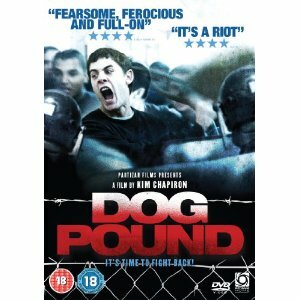 Dog Pound is Scum for the 21st Century, a tough and brutal film set in a young offenders institute for teenage boys that the system doesn’t know what to do with. The long-term inmates have built a rigid power structure based on fear and the guards use the prisoners to let out their own frustrations. Butch, Davis and Angel are new arrivals. They have never met before but they soon realize that the odds are stacked against them and that their only hope for getting through their sentences is if they watch each others’ backs. But friendship will only get them so far when their endurance is stretched to the limit. Kim Chapiron (Sheitan) directs a brutal and action-packed prison drama that takes a long hard look at the juvenile justice system. I really thought this film was a good film. This is a low budget young offender’s action drama with plenty of punches and fighting. The action is good and there is a real draw to the centre character “butch”. These are all fairly unknown actors witch works well for this film. As the above review says it is “Scum for the 21st centaury” witch I would certainly echo but I thought that this was a football film when I saw the cover and I was presently surprised with some good acting and some really great music thought out the film. The music itself plays it’s own part in the film. This is not for the faint hearted as there is some really brutal scene in this but certainly a good film and a challenge of a watch.